Hezbollah supporters have been watching the turbulence next door in Syria with apprehension. Rhetorically, the Lebanese Party of God has backed its patron in Damascus, although its embrace has grown tepid of late. But Hezbollah was worried enough to shift its weapons caches from Syria into Lebanon, reportedly, and its emissaries have been working behind the scenes to mend relations with Syria’s opposition. At the core of their worry is a sectarian concern: Syria without Bashar al-Assad might be willing to jettison Hezbollah — after all, Syria is a majority Sunni nation, and Hezbollah is a Shia standard-bearer. In coordination with Turkey, the United States has been exploring how to deal with the possibility of a civil war among Syria’s Alawite, Druse, Christian and Sunni sects, a conflict that could quickly ignite other tensions in an already volatile region. While other countries have withdrawn their ambassadors from Damascus, Obama administration officials say they are leaving in place the American ambassador, Robert S. Ford, despite the risks, so he can maintain contact with opposition leaders and the leaders of the country’s myriad sects and religious groups. Economist: Will foreigners get involved? …some governments are ramping up efforts to help Syria’s fragmented opposition. Turkey and Qatar have hosted gatherings to forge opposition fronts. France is building up links. Many protesters look eagerly to Turkey, which shares a border of nearly 900km (560 miles) with Syria. Some say that, especially if the pace of killing rises, the Turks may be persuaded to create a buffer zone to protect refugees in a “safe haven” along the border. Others air the idea of other havens, for defecting soldiers as well as civilian refugees, in the south and north-east of the country, along the borders with Jordan and Iraq. The one lesson that Syrians must learn from Libya is this: set up a truly representative national council. A national council including credible dissidents would convince many Syrians who currently sit on the fence to side with the protesters. By discussing post-Assad Syria, a council could also encourage the international community to move more aggressively against the regime. Military intervention is both unlikely and undesirable, but there is more to be done with smart sanctions and pressure. In fairness, the opposition has little political or diplomatic experience, after decades of suppression. But although delay means more bloodshed, opposition figures are still disagreeing on lesser issues than the continuing killings. Some even pulled out of talks about starting a national council. If such discord continues, some in the opposition will bear some of the blame for a lack of success. According to U.S. officials, as of April Iran was providing the Syrian security services with weapons, surveillance equipment, and training. Earlier this month, Ankara intercepted an arms shipment headed from Tehran to Damascus — the second such shipment it caught this summer. The Iranian regime has also provided Assad with technology to monitor e-mail, cell phones, and social media. Iran developed these capabilities in the wake of the 2009 protests and spent millions of dollars establishing a “cyber army” to track down dissidents online. Iran’s monitoring technology is believed to be among the most sophisticated in the world — second, perhaps, only to China. Shortly after Iran shared its know-how with Syria this summer, Assad lifted restrictions on social networking Web sties, presumably to lure dissents out into the open. In addition to sharing weapons and surveillance tools credible reports from Syrian refugees indicate that Tehran sent its own forces to Syria to quash the protests. A number of revolutionary guards from the elite Quds Force are also reported to be there, presumably to train Syrian forces. On May 18, the U.S. Treasury Department mentioned the role of the Quds Force directly, asserting that Mohsen Chizari, the Quds Force’s third-in-command, was training the security services to fight against the protestors. Even if Assad should eventually fall, Iran will not stand idly by; Tehran will surely try to influence any successive government. …the violence [in Hama], while horrible, is still relatively minor compared with the devastation wrought the first time around. Activist groups said that at least 200 people had lost their lives to shelling and snipers in the week’s violence — perhaps 1 percent of those killed in the 1982 massacre. Heightened media attention is undoubtedly one reason for the Assad regime’s comparative restraint. It is also undoubtedly a factor encouraging Syrians to take to the streets across the country in solidarity with their besieged countrymen. Hama’s history may be repeating itself, but this time there’s a chance for a less horrific ending. Some protesters say they should resort to violence. In towns such as Tel Kalakh, Jisr al-Shughour, Idleb and Deir ez-Zor, which are near the border, weapons are being smuggled in. But rifles and Molotov cocktails are no match for tanks and artillery. Other protesters hope that, if the regime becomes even more brutal, chunks of the army may defect, as they did in Libya. But so far the Alawite-led army, with its array of privileges, has remained loyal to the defiant Mr Assad. Of course we do not know yet the final outcome of the events in Syria. As to me, I would rather put my money on Bashar Assad. 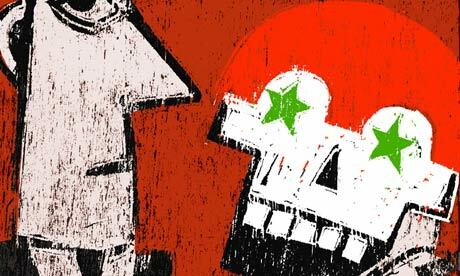 Foreign Policy: The last stand of Bashar al Assad? Internet access has been a bit restricted as of late so I haven’t had the chance to update Today’s Reading for a while. Unreliable connections and a need to dodge the internet po-po keeps my blog posts less frequent than I would like. President Bashar al-Assad’s brutal crackdown on demonstrators bodes about as well for Syria’s economy as it does for democracy. The bloody affair has spooked investors and derailed at least three major Gulf investment projects, according to Al Arabiya. It has also virtually extinguished the tourism industry, previously one of Syria’s fastest-growing sectors. The IMF lowered its growth projections for Syria in April to 3 percent, down from 3.2 percent in 2010, but the Institute of International Finance’s prediction that the Syrian economy will shrink by 3 percent this year is starting to look more likely. U.S. and European sanctions — some directed at Assad and his top aides — could make things worse for the cash-strapped country. Syria, which has no credit rating, cannot borrow on the international lending market and has traditionally relied on Gulf monarchies such as Kuwait for cash infusions. But according to a recent report, Iran, Syria’s ally to the east, may help keep Damascus afloat with a $5.8 billion loan. Of course the biggest news today is the Syrian parliament’s adoption of a new draft law to allow parties other than the Baath party to be formed. Sounds like a big deal but government opponents aren’t celebrating in the streets just yet. Opposition groups have either dismissed them as either symbolic or too little too late. It’s not usually wise to admit to listening to Radio 4, even in the decidedly uncool realm of the blogosphere, but I’ll make an exception this time. This episode of Soft Power Hard News explores the effects of Al Jazeera and Facebook on the Arab world. Definitely worth listening to.